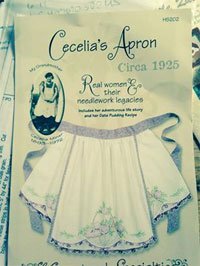 In her late teens, Cecelia's rebellious nature led her beyond the apron-wearing life expected of her. With a lust for a more glamorous lifestyle, she "cut the apron strings" and departed from the traditional chores which defined a woman's proper role in society. Her story is included in this pattern as well as her Date Pudding with Warm Lemon Sauce recipe.